The globe artichoke (Cynara scolymus), also called “French artichoke” and “green artichoke,” derives its common name from the northern Italian words articiocco and articoclos. This latter term is supposed to come from the Ligurian word cocali, meaning a pine cone. The artichoke is a perennial in the thistle group of the sunflower family and is believed to be a native of the Mediterranean and the Canary Islands. In full growth, the plant spreads to cover an area about six feet in diameter and reaches a height of three to four feet. The “vegetable” that we eat is actually the plant’s flower bud. If allowed to flower, the blossoms measure up to seven inches in diameter and are a beautiful violet-blue color. They are available twelve months a year with the peak season in the spring and fall. There are more than 140 artichoke varieties but less than 40 are grown commercially. Today most artichokes grown worldwide are cultivated in France, Italy, and Spain, while California provides nearly 100 percent of the United States crop. One hundred percent of all artichokes grown commercially in the United States are grown in California. Artichoke fields are maintained in perennial culture for five to ten years. Each cropping cycle is initiated by “cutting back” the tops of the plants several inches below the soil surface to stimulate development of new shoots. The operation called “stumping,” is timed to regulate the new harvest season. Baby artichokes are not a separate variety but merely smaller versions of larger artichokes. Their size comes from their location on the artichoke plant. They are picked from the lower parts of the artichoke plant where the plant fronds protect them from sun, in effect stunting their growth. According to an Aegean legend and praised in song by the poet Quintus Horatius Flaccus, the first artichoke was a lovely young girl who lived on the island of Zinari. The god, Zeus was visiting his brother Poseidon one day when, as he emerged from the sea, he spied a beautiful young mortal woman. She did not seem frightened by the presence of a god, and Zeus seized the opportunity to seduce her. He was so pleased with the girl, who’s name was Cynara, that he decided to make her a goddess, so that she could be nearer to his home on Olympia. Cynara agreed to the promotion, and Zeus anticipated the trysts to come, whenever his wife Hera was away. However, Cynara soon missed her mother and grew homesick. She snuck back to the world of mortals for a brief visit. After she returned, Zeus discovered this un-goddess-like behavior. Enraged, he hurled her back to earth and transformed her into the plant we know as the artichoke. Artichoke origins dates back to the time of the Greek philosopher and naturalist, Theophrastus (371-287 B.C. ), who wrote of them being grown in Italy and Sicily. Pedanius Dioscorides (40-90 A.D.), a 1st century A.D. Greek physician of Anazarbus, Cilicia, wrote about artichokes at the time of Christ. While traveling as a surgeon with the Roman army of Emperor Nero, he collected information on the remedies of the period and wrote a work on The Greek Herbal of Dioscorides. Originally written in Greek, Dioscorides’ herbal was later translated into Latin as De Materia Medica. It remained the authority in medicinal plants for over 1500 years. 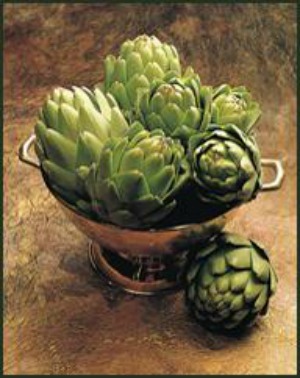 Ancient Greeks and Romans considered artichokes a delicacy and an aphrodisiac. In Ancient Greece, the artichoke was attributed to being effective in securing the birth of boys. 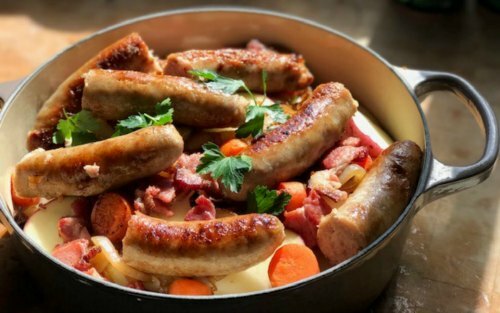 In 77 A.D., the Roman naturalist Caius Plinius Secundus, called Pliny the Elder (23–79 A.D.), called the choke “one of the earth’s monstrosities.” Evidently he and his colleagues continued to enjoy eating them. Wealthy Romans enjoyed artichokes prepared in honey and vinegar, seasoned with cumin, so that the treat would be available year round. Beginning about 800 A.D., North African Moors begin cultivating artichokes in the area of Granada, Spain, and another Arab group, the Saracens, became identified with chokes in Sicily. This may explain why the English word artichoke is derived from the Arab, “al’qarshuf” rather than from the Latin, “cynara.” Between 800 and 1500, it’s probable that the artichoke was improved and transformed, perhaps in monastery gardens, into the plant we would recognize today. Artichokes were first cultivated at Naples around the middle of the 15th century and gradually spread to other sections of Europe. After Rome fell, artichokes became scarce but re-emerged during the Renaissance in 1466 when the Strozzi family brought them from Florence to Naples. 1800s – French immigrants brought artichokes to the United States in 1806 when they settled in the Louisiana Territory. But though the first commercial artichoke fields were developed in Louisiana, by 1940 they had mysteriously disappeared. They were later established in Louisiana by French colonists and in California in the Monterey area by the Spaniards during the later 1800s. Johann Wolfgang Goethe (1749-1832), poet and dramatist, shunned the artichoke. In his book Travels Through Italy, Goethe says, “the peasants eat thistles,” a practice he could never adopt. 20th century – In 1922 Andrew Molera, a landowner in the Salinas Valley of Monterey County, California, just south of San Francisco, decided to lease his land previously dedicated to the growing of sugar beets to Italian farmers that he encouraged to try growing the “new” vegetable. His reasons were economic as artichokes were fetching high prices and farmers could pay Molera triple what the sugar company did for the same land. By the early 20th century, Fannie Farmer noted in her ninth edition of her cookbook that California artichokes were selling in Boston for 30 to 40 cents each. In the 1920s, Ciro Terranova “Whitey” (1889-1938), a member of the mafia and known as the “Artichoke King,” began his monopoly of the artichoke market by purchasing all the produce shipped to New York from California at $6 a crate. He created a produce company and resold the artichokes at 30 to 40 percent profit. Not only did he terrorize distributors and produce merchants, he even launched an attack on the artichoke fields from Montara to Pescadero, hacking down the plants with machetes in the dead of night. These “artichoke wars” led the Mayor or New York, Fiorello La Guardia, to declare “the sale, display, and possession” of artichokes in New York illegal. Mayor La Guardia publicly admitted that he himself loved the vegetable and after only one week he lifted the ban. Check out How to purchase, store, prepare, cook, & eat artichokes (with photos). Nearly one hundred percent of all artichokes grown commercially in the United States are grown in California. In the 16th century, eating an artichoke was reserved only for men. Women were denied the pleasure because the artichoke was considered an aphrodisiac and was thought to enhance sexual power. Artichokes are one of the oldest foods know to humans. Marilyn Monroe was the first official California Artichoke Queen in 1949. One medium to large artichoke will yield approximately 2 ounces of edible flesh. If the artichoke feels heavy for its size and squeaks when squeezed, you have found a fresh artichoke. Select globes that are deep green, with a tight leaf formation, and those that feel heavy for their size. A good test of freshness is to press the leaves against each other which should produce a squeaking sound. Browning of the tips can indicate age, but can also indicate frost damage. Fall and winter artichokes may be darker or bronze-tipped or have a whitish, blistered appearance due to exposure to light frost. This is called “winter-kissed.” Look for tender green on the inside of petals. Many consider these frosted artichokes to be the most tender with intense flavor. Avoid artichokes which are wilting, drying or have mold. To store fresh artichokes at home, sprinkle them with a little water and refrigerate in an airtight plastic bag. Do no wash before storing. They should last a week when stored properly. Cynara Erotica, by A. C. Castelli, published by A.C. Castelli Associates, New York, NY. History of Food, by Maguelonne Toussaint-Samat, Barnes & Noble Books, 1998. Tales of the Artichoke King, by Allan May, published in the Crime Magazine. The Rise of the Mafia in New York: From 1896 throught World War II, by Giuseppe Selvaggi, Translated and edited by William A. Packer). Indianapolis, Ind., U.S.A.: Bobbs-Merrill, 1978. 182+ p., ill., index, 24 cm. Translation of: Mia tomba New York. (Italian). Thistle Eaters Guide, by R. E. Scammell, published by Florest Press, 1970. The Artichoke Cookbook, by Patricia Rain, published by Celestial Arts, 1985. The Sensuous Artichoke, by A. C. Castelli and C. A. Catelli, publisned by A. C. Castelli Assoc., 1998.